Last night I dreamt I was with Tim. We were looking over a rack of used clothes (he used to work at Savers before he got hired as a teacher and during the summers). I think we were laughing at the clothes. Tim said he needed a drink, and he started drinking some rum from a bottle that looked more like an amber beer bottle. I told him I wanted a little, so I started to take a swig from the bottle but only drank a very small bit. Tim seemed a bit angry about something. Maybe because drinking isn’t as much fun when you’re dead. And Stan, I’m sorry, I forgot to say hi to him for you. Those were the days when we used to go out drinking with Tim. A very brief dream with Tim that happened between long bouts of insomnia last night. I dreamt I was in an old house/apartment, sort of like the one we lived in on Main Street, except it was on a 2nd floor, and the walls were sort of a salmony-hot pink. A couple years ago, Bill was helping my mom clean out the basement. I am fortunate to know a chemist, as I would have no idea what to do with all the stuff my dad had collected and stored away for all these years. I told Bill to keep a lookout for a piece of carborundum that my dad had. Carborundum is a man-made “mineral” that has industrial uses but also is collected by those of us who appreciate its aesthetic qualities. 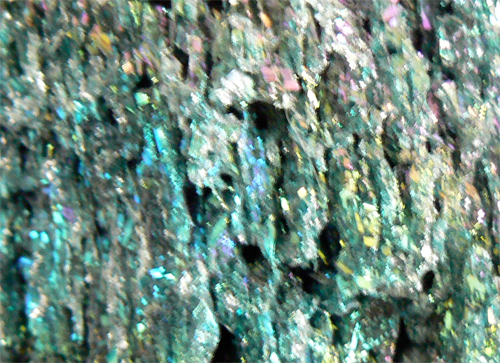 My dad had given me a very small piece of carborundum a long time ago…about the size of a thumbnail. In true father form, he never gave me the large piece which was a couple inches or so across, although it’s not as if he kept it out on display, or brought it out to enjoy once in a while. Just like with the carnival glass–stored away in the basement, hidden from view, while his daughter could be enjoying it, he was keeping it just because. Just because it was his, and he and generosity were strangers, except when it came to strangers–strangers in the name of the Catholic Church Charities–then he was generous. There was obviously aspects of Tim’s life that were unbeknownst to other parts of his life. He kept his sexual preferences secret from his family (although they must know now because the Madison obituary did mention his husband–the obituary in his family’s part of the state was altered to a more Republican-friendly version), and around us he always talked about how much he couldn’t stand the church. So it was a surprise for me to find out after his passing that he was studying to be some sort of Secular Franciscan…something…I don’t know the terminology. Even if he had a hard time making a clean break from the religious way in which his family brought him up, (unlike me, in fact, I didn’t have to break because I was already broken seemingly from the start), I still can’t imagine him having wanted such a traditional, impersonal sort of funeral. But then again, it is very foreign to me, the whole Catholic funeral thing. I can now fill up one hand with the number of funerals I have attended in my life. My earliest memory was of my grandfather–mother’s side. I remember the color white, and I remember my mom lifting me up to see him him in his casket. I was only about 2 and a half. I’ll have to ask my mom, but I think the union he was in was able to give him a good funeral. I don’t remember churchiness. I might be mistaken, but something sticks in my mind about that. He was the only grandparent whose funeral I attended. My dad’s mom’s funeral was in Massachusetts and my mom and I stayed in Colorado while my dad took care of that. My mom to this day still speaks not well of her MIL. I don’t think my dad’s dad’s funeral was large, and my parents thought I’d best not attend anyway. I was a teen then, going through my own difficult times. And my mom’s mom’s funeral was held in Wisconsin when I was living in Colorado, so I’d have to miss work at a job I just started, so I couldn’t afford to go. I attended a funeral for my friend Ron from high school when I was in my 20s. It was in a Unitarian Church and very humanistic. They played some music that he had composed. The funeral for my major art professor from grad school wasn’t held at a church, but at a funeral home, which is much more sensible than in a church. Stan’s Dad’s funeral was in a Methodist church, but it had a very humanistic aspect too. I remember people talking about Gordon during this service. But this one, I had no idea it would be so hand’s off and impersonal. I am just shocked. I cried not just for the loss of Tim, but with anger at how removed from Tim’s life the whole service was, and how anti-gay coded the sermon or talk or whatever they call that, was. I tried looking at the architectural elements, trying to figure out whether altar embellishments were gold leaf or just paint, stared at chandeliers trying to figure out how to render them in Bryce, anything to get my mind off of how I felt towards the Catholic institution. I am so glad at least he will be cremated. When I read “Burial Mass” in the obituary, I thought they were really going against his wishes. If they only knew, like we do and his other friends we talked to, Dave and Julie, knew, Tim would want his ashes sprinkled where the dogs he grew up with were buried on the family farm. DREAM with Tim…Symbolic for Something? I was in a building that seemed familiar. It was sort of like the cross between my two art studios when I was in grad school…the Inhumanities Building and the Education Building. I don’t know if Stan was with me, but there were other people there. I was on the 4th floor (the floor where Tim spent much of his time when he was in the hospital), and there were elevators near windows, which was not like any of the above-mentioned buildings. I’m looking around and anticipating seeing rooms that are classrooms, but instead they are hospital rooms. Tim was in a wheel chair, and he was going down to the first floor with some other people. I look out a window by an elevator, and I see Tim. He’s laughing and knocking on the window. Somehow he is trapped outside the building and he can’t get back in, or back on the elevator. We (me and the other people standing around in the hall) are trying to figure out how to get him back inside where it is warm. He didn’t seem too angry about it…he seemed to think it was funny.